Barbados is one of the most beautiful Islands in the Caribbean and is predominantly famous for its spectacular white sandy beaches, colourful tropical fish, incredibly popular restaurants, crystal clear turquoise waters, private condos, villas and of course its welcoming people. Barbados expands over 166 square miles and is based in the most easterly part of the Caribbean Islands. It is also ideally located as it is one of the islands least affected by hurricanes and tropical storms making a visit at any time of the year possible. An incredibly beautiful tropical island, you will find some of the most luxurious Barbados villa rentals along the West Coast of the island. If you are looking for the top beaches to explore then look no further than Barbados. Getting to Barbados is also very easy. Whether you are travelling from the UK, Mainland Europe, The United States, Canada or other parts of the world, you will find that connections to The Grantley Adams International Airport are simple to access. Barbados is truly an exquisite, beautiful island, with lots of art activities, nightlife, music, history and some of the best restaurants to be found in the Caribbean. The cuisine of Barbados is predominantly Bajan in style with a blend of African, West Indian and European flavour. During your visit, you will be able to get some of the freshest fish in the world including tuna, shrimp, kingfish, lobster, flying fish and red snapper on many of the menus. Barbados has some of the best, high-end ocean side restaurants on the planet but there is also a great selection of down to earth eateries you can visit and enjoy the lovely food and great prices in a relaxed environment. It is a stunning tropical island that is also wonderfully vibrant. It offers a unique mix of sophistication and culture which can be hard to find on some of the other islands. Over the years, the West Coast often named the platinum coast has become synonymous with both glamour and sophistication. Yet there is another wonderful off the beaten track side to Barbados where you can get to experience a great amount of culture and history. In this popular paradise, you will be able to do discover everything from great rum shacks, virtually unexplored beaches, to wonderful historical sites and museums. You can read about what the Crazy Tourist site says are the 15 best things to do in Barbados here. The sports scene in Barbados should not go unmentioned either. There are several top-class golf courses designed by famous talents such as Tom Fazio and Robert Trent Jones. Indulge in some leisurely golf as you make use of the spacious courses and the most exceptional views during your stay here. In addition, there is great cricket, tennis, polo, cycling, sailing, scuba diving, fishing, surfing and a wide variety of water sports to choose from all over the island of Barbados. Barbados is also an island that is very close to the hearts of all our team as it is where we first started Exceptional Villas. We have our own dedicated team for Barbados that includes two villa experts, Yvonne and Paul as well as a full-time concierge department, to ensure you have an exceptional stay. It is our policy to ensure that each of our our Barbados team has an intimate knowledge of both our Barbados villa rentals as well as the island. They have the best rates and offers per night and per week for you to take advantage of. Paul is also your first port of call for Italian Villas, villas in Nevis, and St Kitts Villas. Yvonne knows more than a thing or two about villas in Mustique, St Vincent and the Grenadines. Julie who oversees our Barbados Concierge department will be able to give you recommendations on the most popular and highly recommended Barbados restaurants beaches, excursions and trips you might like to consider. If you want to know more about us, then please follow us on Facebook, or on Instagram for new updates and great deals on our vacation rentals in Barbados. Trust, and as the most trusted villa experts in the world, is at the cornerstone of our business. Therefore, we spend a lot of time with each of our clients to ascertain their needs, requirements and dreams when helping them select the best of our Barbados villas, Condos and Apartments. We then match both the villa and the location to our client's discerning requirements to ensure that they have the best possible experience with us and most importantly enjoy their stay. We are very proud of our consistent 5-star reviews with Trust Pilot and Trip Advisor. From the moment you pick up the phone or email us, we will guide you through the process and make sure that every detail of your vacation is perfect. Once you have booked, our complimentary concierge department will organise everything for you depending on your requirements. This can start with a VIP meet and greet at the airport, fast track through immigration, car hire, limousine transfers, restaurant reservations, private yacht chartering and advise on all the best things to do and see that is in close proximity and easy access from your private paradise. When you get begin your stay in Barbados, you will be equally well cared for as each of our Barbados vacation rentals has an allocated property manager who will be available to you on request, should you have any extra requirements once you arrive. If you are looking for luxury Barbados villas, we would be delighted to assist in finding you the perfect property. You can take time viewing our website to get more information on exceptional villas in Barbados or contact our team of experts to find out more about this wonderful Caribbean Island. We also have some stunning Barbados vacation rentals as well as incredible Barbados resorts for you to enjoy. Barbados has a very glamorous reputation and is one of the most frequented of the Caribbean Islands by the jet set and celebrities. They flock to the island to experience the beautiful tropical climate, luxury Barbados Villas, designer shopping outlets and the many beautiful Zagat rated beachfront restaurants dotted across the map. Barbados is also one of the best destinations in the Caribbean for family holidays and especially popular for multi-generational vacations.There is just so much to do, see and explore on the island and for all age groups from little toddlers to teenagers. We believe at Exceptional Villas that there is no better way to experience a family holiday than at one of our Luxury Barbados Villas. You will get all the services, 5-star pampering and luxuries that you might expect in one of the island's top hotels. You also get a profusion of spacious interiors, expansive gardens and a sense of freedom that comes with your own tropical paradise. Of course, the beautiful West Coast sandy beaches are one of the main attractions, but if you venture beyond the beach, you will find many exciting experiences that will thrill even the most intrepid of explorers. There is Harrison's Cave which is an amazing maze of living caves full of sparkling streams, rushing waterfalls and caverns. For animal lovers, there is the Barbados Wildlife Reserve which showcases all the native animals and bird life that are located on the island. You will see everything from Green Monkeys to the most exotic of parrots and native flamingos. Another family favourite is the Atlantis Submarine experience. You can go during the day or at night and explore the vibrant underwater life as well as several interesting shipwrecks. You will learn about the pirates of the Caribbean and maybe even feel like you are one for a day. Barbados is also one of the most romantic of the Caribbean islands and perfect for a Caribbean Honeymoon or intimate wedding. Imagine yourself sitting on your Barbados Villa terrace with a glass of champagne or rum punch in hand watching a spectacular view of the warm, pink sunset ahead. You can also enjoy a lovely meal at a table right next to the water's edge. Your toes in the sand, candles everywhere, the gentle lapping of the water close by and the twinkling of a million stars overhead. Barbados is also ideally located for gentle days spent on one of the immaculate white sandy beaches enjoying the sun and scenery. Then there are plenty of adventures that you can share together such as swimming with turtles and the abundance of tropical fish, or a romantic catamaran trip. Getting married in Barbados is also a relatively simple process, and we at Exceptional Villas in conjunction with our Barbados Wedding coordinator will be on hand to ensure that every moment and detail of your special day is well taken care of. You can choose from getting married on the sandy beaches, to your secluded villa or maybe in one of the beautiful old churches full of stained glass windows that are laced throughout the island. Barbados is a jewel in the crown when it comes to villas and Caribbean vacation rentals. If you are looking for privacy then there is no better place to be than in the comfort of your own private home. With so many Barbados Villas, it is hard sometimes to work out which one is perfect for you. That’s where our expert team come into their own. We don't expect you to search though all of our villas in Barbados, instead we want you to speak to on our our experts. They will spend time with you chatting on what your dream Barbados Villa looks like and will match the villa to your dream requirements. Coupled with a best price match guarantee, and complimentary pre-arrival concierge service, you will be in excellent hands. At Exceptional Villas, we feature over 450 of the most luxurious villas in Barbados but we also have a few firm favourite villas Barbados that we love, and our clients come back to, year after year. We very much look forward to welcoming you. Barbados is well-known for having the most incredibly beautiful beaches. When you think of Barbados, you immediately think of Sun, Sea and Sand. After all, most people travel to Barbados for the beach! The island is known for its powdery white sandy beaches and crystal-clear waters. The beaches here are perfect for swimming and snorkelling. While snorkelling in Barbados, you will see the most amazing sea-life including turtles. At Exceptional Villas, we feature some of the nicest Barbados Beach Villas. Each of these homes is located on the beach offering incredible sea views and gentle sea breezes. Of course, staying in a beach villa in Barbados means you will be relaxing on the beach with your toes in the sand within minutes. Most of our clients request a beachfront villa on the most popular beaches including Paynes Bay Beach, Gibbs Beach, Mullins Beach or the renowned Sandy Lane Beach. There are many Barbados Beach Villas located on Paynes Bay Beach, but one of our personal favourites is New Mansion. This home is unique in that it is one of the only private beachfront villas with its own private pool located on Paynes Bay. The Villa has the ideal location offering guests stunning sea views, crystal clear waters perfect for swimming and a fabulous private retreat and you are just a few minutes’ walk to the nearby Daphne’s restaurant. 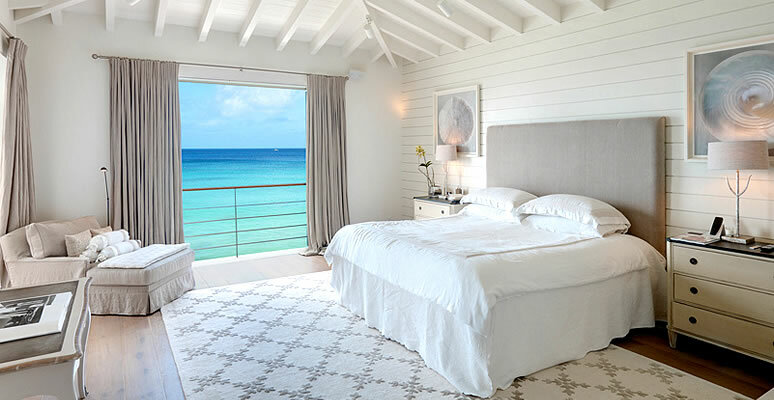 Another firm favourite Barbados beach villa is the brand-new villa at the St James Barbados. A 4,540 sq ft beachfront property the ultra-modern villa enjoys amazing views and is one of the nicest beachfront villas on Payne’s Bay. Barbados Villas on the Beach is a lovely property located in the heart of Holetown. If you are looking for a relaxing vacation and really want to be on the beach but equally want to be within walking distance to restaurants, bars, shops and cafes, then this is the perfect place to be. 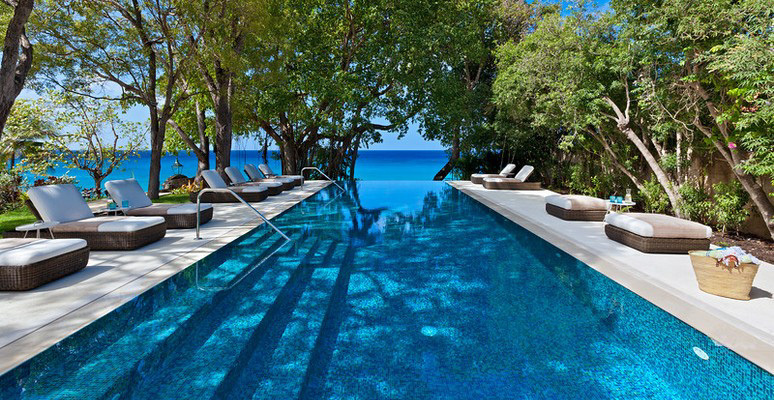 Most of our Barbados villas feature their own private pool. When choosing your Barbados Villa, we would highly recommend having a private pool so that you can enjoy time with family and friends together in the privacy of your own home. Staying at a villa means you can enjoy the comfort and privacy of your own home and equally enjoy the private space surrounding the home. Having a big large pool is a must for a large family group or multi-generational family. Leamington Pavilion has one of the nicest pools in Barbados. It is one of the biggest pools on the island and is ideal for a large group of friends. The pool is surrounded by a manicured garden offering plenty of outdoor space to relax. Your staff will also be on hand to ensure you are served poolside cocktails and will bring you some snacks as you enjoy a refreshing swim. At the end of the garden, you will find a lovely beach and the Caribbean Sea! Gardenia Villa is one of our most popular beachfront villas in Barbados, but not only is the home right on the beach, but it also features one of the nicest pools on the island. Our team had the pleasure of staying in this luxury villa on their recent visit to the island. The pool is super private surrounded by lush trees and plants and is set back from the beach. The outdoor space is wonderful, and the pool is surrounded by sun loungers and umbrellas. There is also a lovely outdoor dining area where your staff can prepare an alfresco breakfast or lunch for you by the pool. For a large group of up to 18 guests, Greensleeves is the perfect luxury Barbados villa. It is one of the most luxurious villas on the island, and it features one of the most unique pools. The large free-form pool features a mini island with coconut trees and a swim-up bar. Kids and adults alike just love it. If you are looking for a modern Barbados villa with pool, then look no further than Atelier Villa. Its modern and sleek design concept can be seen both inside and outside. The terrace area features a lovely private swimming pool sitting on a ridge above the West Coast offering mesmerising and incredible sunsets. Eden at Sugar Hill is also a firm favourite for guests looking for a Barbados villa with a private pool. The large pool area is a wonderful place to sit back and relax on a sun lounger while reading a book or enjoy a morning of sunbathing followed by a refreshing dip in the saltwater pool. You won't find a better Caribbean Villa than this! 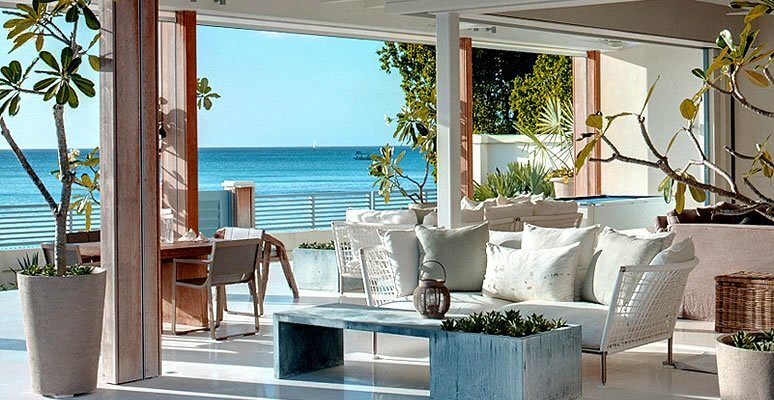 The Dream is an exquisite beachfront villa located in one of the most exclusive and sought after residential areas in St James on the West coast of Barbados. Guests adore this incredible home and the view is one of the best on island. The wonderful location provides the benefits of being quiet and less crowded than some of the other areas yet only ten minutes from Holetown where you will find lots of restaurant and shopping options. The Dream has five bedrooms and is a quintessential luxury Villa that is the epitome of modernity, charm and style. There are lovely views from almost every room that looks out over the white sandy beach and the glistening Caribbean Sea beyond. Every part of this luxurious Barbados Villa is exquisite, but without a doubt, our favourite part is the large pool and outdoor bar and terrace area. This is generally where our guests like to spend much of their time enjoying the Barbados sun, spending time with loved ones, enjoying the sunsets or just relaxing and forgetting about the cares of the world. In terms of Staff, every stay at The Dream in Barbados comes with a full team of professional staff who will be on hand throughout your stay to ensure that your every wish is catered for. In addition, all bookings come with the professional and complimentary Exceptional Villa concierge service as well as the Exceptional Villa VIP package. 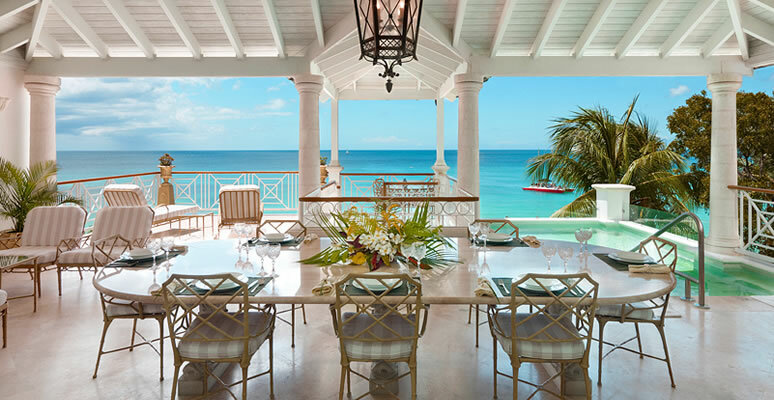 Crystal Springs is not only one of the most beautiful beachfront villas in Barbados, but it is also one of the most beautiful we have come across anywhere in the world. Crystal Springs has an incredible location on a cliff top overlooking the Caribbean Sea and is embedded in 1.7 acres of lush tropical gardens and foliage. Crystal Springs is enveloped by nature on all sides. There is a beautiful natural gully that runs down to the sea. Just below the main house is a secluded cove, and the grounds are full of tropical flowers and the sounds of singing birds and tree frogs. The views from the house are breath-taking, and from almost every corner, you can see the crystal-clear azure waters. The house is set over six different buildings and comprises a massive 12,000 square feet of spacious living space. Each of the six residences is connected by beautiful stone pathways, and terraces and the interiors are equally as exquisite as the exteriors. There are ten en-suite bedrooms in total making Crystal Springs one of the perfect choices for an intimate Barbados Wedding or a very special occasion. There are many outdoor dining areas, but our favourite is the terrace which sits on the cliff top looking directly over the cove. It is made almost entirely from Coral Stone, and there are several beautiful trees to provide natural shade whilst you enjoy some exquisite food with the best views on the planet. La Mirage at Old trees is another firm favourite villa of our Exceptional Villa Team. It was one of the first villas we every inspected, and despite having seen thousands of luxury Barbados villas since then, La Mirage remains one of our well devised, top choices. The location on the top floor of The Old Trees Condominium Development is one of the most exclusive in Barbados and ensures some of the best views on the island. The large penthouse looks directly over Payne’s Bay Beach which is one of the nicest in Barbados and is easy to access with a short walking distance to the Sandy Lane Hotel in low tide. It is also possible to walk to several of Barbados best restaurants such as Daphne’s which is always a bonus. One of our favourite parts of La Mirage at Old Trees is the terrace. It is a large spacious open plan living and dining area as well as embedding a beautiful plunge pool. There are few better places on the island of Barbados to enjoy a spectacular sunset, a barbeque or dinner under the stars with friends and loved one. The other aspect of La Mirage that we really like is the fact that it has two very beautiful king-sized ocean front bedrooms of equal standard making the property perfect for two small families or two couples vacationing together. Whilst staying at Old Trees, you will be able to use the large communal pool anytime, and you will also be very well looked after by David, the Beach Butler who prepares your own private beds on the beach each day. 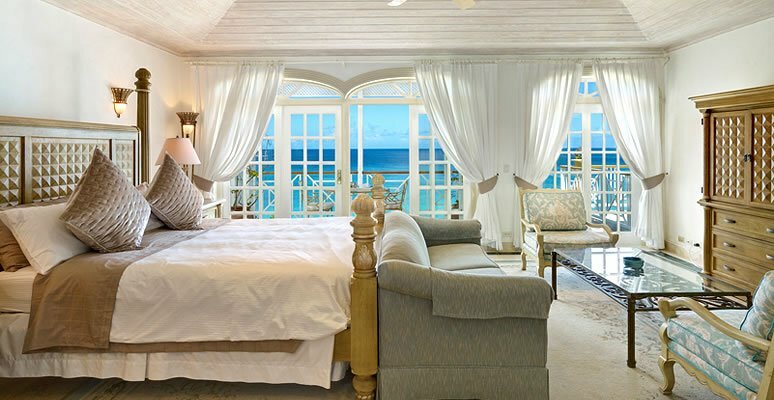 Everything about a stay at this lovely Barbados villa is absolute bliss. Smugglers Cove Barbados is a collection of very luxurious condominium style properties located on one of our favourite Barbados beaches; Payne’s Bay. They are without a doubt our most popular Barbados Vacation Rentals and for a good reason. The location on Paynes Bay, one of the islands best beaches, is hard to beat. They each have beautiful terraces, with access to the communal pool and a private area on the beach available only to guests of Smugglers Cove Barbados. There are 8 properties to rent in total, and each of them is different in their layout and décor. The Smugglers Cove Penthouse offers a very contemporary and chic feel for example whilst Smugglers One Barbados has a beautiful Caribbean feel with the added benefits of being on the ground floor and having direct access to the pool and turquoise sea which is just a few steps from the terrace. All our guests love Smugglers Cove, and many come back year after year. They all love the location and being able to walk to Sandy lane during low tide as well as to several of Barbados’s best restaurants which are a short stroll along Payne’s Bay. The lovely town of Holetown is also just a very short 3 or a 4-minute drive away. The villa is also great for a family looking to be on the West Coast of the island. If you are looking for a highly personalized service then contact Exceptional Villas to book your Barbados Villa Rental today, we will guaranteed to get you the best offer and ensure your vacation is a memorable one. If you can't decide where to go on vacation in 2019, you can view all of our destinations here.